I’m not sure what surprises me more about this movie: that nobody had made a film about the domestication of the wolf or that anyone needed to make that film at all. 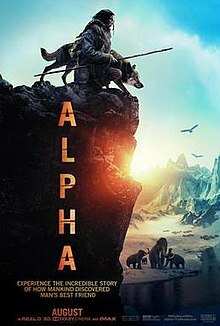 Consequently, Alpha (2018) seems a little unnecessary and highly predictable as the “hero’s journey” plays out. The trailer doesn’t leave much for the imagination, as a lot of the events in this film don’t have any significant twists that the astute viewer wouldn’t see coming. And maybe I’m biased because I’d be more of a cat person than a dog person—despite being allergic to both. Visually, though, Alpha does provide some fantastic shots of wilderness that one can only find in places like Canada and Iceland. Plenty of the flat silhouette shots of characters traversing huge distances and the stylized slow-motion events made this movie feel a bit like 300 (2006), which isn’t necessarily a bad thing. The real trouble is that it takes these characters so long to traverse these distances that there isn’t much excitement in the first half of the film (aside from the inciting incident). If the beautiful scenery can keep your attention, you’ll be fine, though. A few of my more significant qualms come with the plot of the film, though. Many of the characters’ decisions seem to be merely present to drive the desired plot along, even if they don’t make much sense. Like, I get why these early humans would go out to hunt a huge herd of animals at once, but how are they preserving that much meat? How are they hauling tons of meat four days back to their settlement (I’ve played enough “Oregon Trail” to know there’s a weight limit)? Why isn’t the settlement near this hunting ground? Lots of these plot choices led to the main character’s eventual survival story, but they don’t work if the survival was never needed in the first place. A scenically beautiful film with a predictable (if not nonsensical) plot, I give Alpha 3.0 stars out of 5.